Sharing my enthusiasm for natural dyeing with you! Where to begin when natural dyeing is a passion and every recipe produces just the most amazing shades....?! How is natural dyeing different compared to dyeing with synthetic colours? First of all I need to stress that my expertise lies in dyeing protein fibres, meaning animal fibres, and that includes silk. Plant fibres like cotton, hemp, linen, etc. require a different process. You can find information re. dyeing plant fibers on this website, hosted by Maiwa in Vancouver, BC. In natural dyeing the wool fibres need to be opened so that they can absorb the colour pigments. For this you need to mordant the fiber beforehand. The most common mordants are Alum (Potassium), Tartaric Acid and Cream of Tartar, Soda Ashes, and they are quite benign. Other natural dyers use copper and iron but I don't because I don't like to dump these substances in my garden (that's what I always do when I'm done with a dye batch). Klick here to find mordants at Maiwa. Pros: beautiful, warm colours that don't clash with each other; using dye stuff that can easily grow in every garden; using resources and techniques that have been around for thousands of years and keeping them alive for future generations; a creative process in which many colour variations and nuances can be achieved; becoming knowledgable re. chemistry and botany. So you need to find out for yourself if natural dyeing is for you. Due to the fact that most dye procedures need high temperatures, you want to choose a well ventilated place. Both the mordants as well as the dyes have very distinct smells, indigo in particular (which should only be used outside). You also want to find the biggest pot in the house. The before mentioned high temperatures can make wool felt very quickly if it cannot float freely in sufficient amounts of water. I use a 20 quarts/ litre pot for not more than a pound of wool/ silk. The chosen recipes are making use of water and dyes in a very sustainable way but that requires a bit of thinking and planning ahead. So read the recipe very carefully, check the timing of mordants and dyes and create a schedule that is realistic for you and your lifestyle. Your most important tool will be a digital scale that measures in grams. All amounts of mordants and dyes are measured in relationship to the weight of fiber you want to dye. Example: if the recipe calls for 10% of Alum as a mordant and your fiber weighs 250g you will need 25g of Alum. All tools like spoons, tongs, pots, strainers, etc. should only be used for dyeing. You will also need a dye cloth, a square piece of muslin or a similar, somewhat more open fabric, approx. 14x14 inch/ 40x40cm, a long twist tie and some clothes pegs. Even though some dyes are so-called contact dyes, I prefer them not to be in direct contact with the fiber in order to avoid blotches and hard to remove vegetable matter. For scouring before dyeing and washing your dyed fiber you will need a gentle ph-neutral wool washing detergent like Orvus Paste. Maia offers it here. For setting your dyed fiber you can use cheap white vinegar, e.g. Heinz White Vinegar. 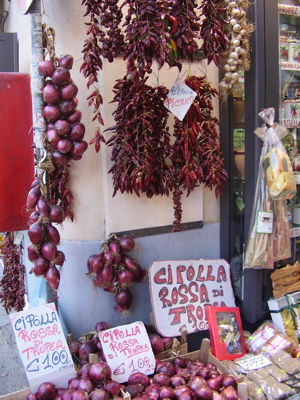 Some natural dyes are ph sensitive. You might want to check the ph of your water. You can get cheap ph testing paper strips in every drug store. Our water here is nearly ph neutral which is ideal. If the recipe is ph sensitive and your water is either alkaline or acidic, I will mention ways to remedy this. The ratio of synthetic vs. natural in your fiber needs to be at least 50% natural, otherwise the colour pigments won't be absorbed properly and the outcome might be disappointing. 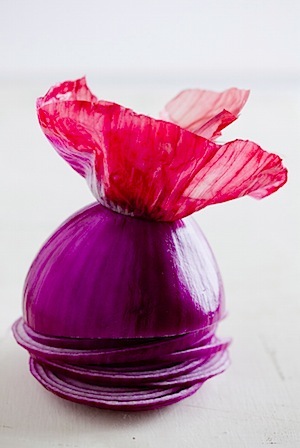 I have chosen the following recipes because they a) produce some of the most amazing colours and b) they are very reliable and always produce more or less the same result. My all-time favourite recipe since the first time I used it 13 years ago! This is a recipe that gives you piles and piles of different shades of sunny yellow! It also has a beautiful smell. And both English Marigold (calendula) as well as French Marigold (tagetes patula) grow abundantly. 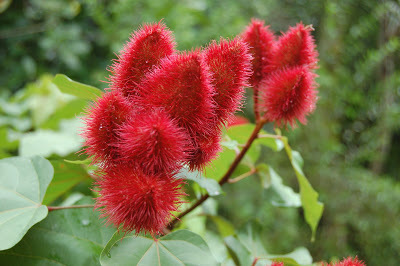 Their blossoms are easy to dry and regrow quickly without killing the whole plant. If you are too impatient to wait until the summer, Maiwa is a source where you can get them right away. Klick here. If you use more of the orangy/ red kind of French Marigold, your colours will be deeper, especially in the first 2 dips. Due to the fact that you can get as many as 7 different shades of yellow, you can spread the dyeing and mordanting process over 2 days (or plan for a whole day if you are lucky to do so!). Mordanting: Weigh your fiber, you will need 20% Alum (example: if you have 200g of fiber you will need 40g of Alum). Bring a big pot of water to a boil, add the Alum and let it dissolve completely. Then add the fiber, making sure that it can float freely. Turn the heat down and let it simmer for 20 minutes, gently moving it occasionally. Then turn it off and let the fiber cool down in the mordant bath for at least one hour. Take out the fiber, rinse it gently without too much agitation and dispose of the water. Dyeing: There will be 7 consecutive dips, so you need to have enough mordanted fiber for each one (equal amounts for each dip). Do the math and figure out this amount because it will determine how much dye you need. This recipe calls for 150% of dried and finely cut blossoms of calendula/ marigold. Example: if you are planning on dyeing 50g of fiber in each of the 7 dips (a total of 350g) you will need 75g of dried flowers altogether. Put the dried, finely cut flowers in a big bowl, pour boiling water over them and let them steep for 1 hour. They will expand, so make sure to use enough water. In the meantime fill your big pot half full of water and bring it to a simmer. After 1 hour use your clothes pegs to attach the dye cloth to the rim of the pot, with the middle of it slightly sagging onto the surface of the water. Please do this carefully, you will be working in very hot steam! Now scrape the soaked flowers from the bowl onto the dye cloth, unpeg it one after the another and bring the edges of the cloth together without the contents falling into the water. Wrap the twist tie tightly around und let the now filled and secured pouch sink into the pot. Top up the water, if necessary. 1st dip: add appropriate amount of fiber and let it simmer for approx. 45 minutes, gently moving it around occasionally. Then remove it with the help of a strainer, making sure to collect as much of the dripping dye water as possible in order to return it to the pot. Let the dyed material cool down, then gently wash it, rinse it and let it sit in a second rinse bath with a good shot of white vinegar for 10 minutes. Then spin it in the washing machine and dry it, ideally horizontally on a drying rack. Repeat this procedure up to 6 more times until you feel that the dye bath is exhausted. If you have questions regarding this recipe use the 'Contact Us' page. Also let me know how you like it, I'd love to hear from you, and send pictures, too! This wonderful dye stuff creates intense shades of orange which remind me of packaging of the 70ies. It's widely used in Mexican cuisine, and it's what gives cheddar cheese its colour. This is the dye you want when making anything 'pumpkin' around Thanksgiving! It's not 100% colourfast but this can be remedied by soaking the dyed fiber in a vinegar bath for 10 minutes prior to washing. 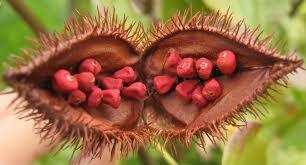 Make sure to buy real annatto, not achiote seeds, which will give you a much browner, less vibrant shade of orange! The seeds need to be soaked overnight in water with soda ashes, also available at Maiwa, at a ratio of 10% to weight of dry fiber. The next day the mix gets pureed with a wand mixer or in a blender and gently boiled for 1 hour prior to dyeing. Warning: use only stainless steel utensils/ pots or glass, plastic will turn orange and stay that way! Mordanting: Weigh your dry fiber, you will need 15% Alum (example: if you have 200g of fiber you will need 30g of Alum) and 10% cream of tartar. Bring a big pot of water to a boil, add the Alum and cream of tartar and let it dissolve completely. Then add the dry fiber, making sure that it can float freely. Turn the heat down and let it simmer for 20 minutes, gently moving it occasionally. Then turn it off and let the fiber cool down in the mordant bath for at least one hour. Take out the fiber, rinse it gently without too much agitation and dispose of the water. Dyeing: There will be 3 consecutive dips, so you need to have enough mordanted fiber for each one (equal amounts for each dip). Do the math and figure out this amount because it will determine how much dye you need. 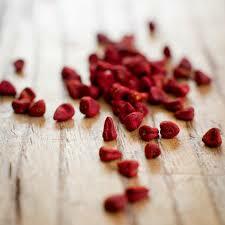 This recipe calls for 100% of dry annatto seeds. Example: if you are planning on dyeing 50g of fiber in each of the 3 dips (a total of 150g) you will need 50g of annatto altogether. Fill your big pot half full of water and bring it to a simmer. Use clothes pegs to attach the dye cloth to the rim of the pot, with the middle of it slightly sagging onto the surface of the water. Please do this carefully, you will be working in very hot steam! Now scrape the boiled annatto onto the dye cloth, unpeg it one after the other and bring the edges of the cloth together without the contents falling into the water. Pull this out of the water, wrap the twist tie tightly around und let all dye liquid drip from the now filled and secured pouch into the pot. Top up the water, if necessary. Set the pouch aside on a plate for the second dip. 1st dip: add appropriate amount of fiber and let it simmer for approx. 45 minutes, gently moving it around occasionally. If you dye silk don't let the temperature go higher than 80`C. Then remove it with the help of a strainer, making sure to collect as much of the dripping dye water as possible in order to return it to the pot. Let the dyed material cool down, let it soak in a vinegar bath for 10 minutes, then gently wash it, rinse it and let it sit in a second rinse bath with a good shot of white vinegar for 10 minutes again. Then spin it in the washing machine and dry it. 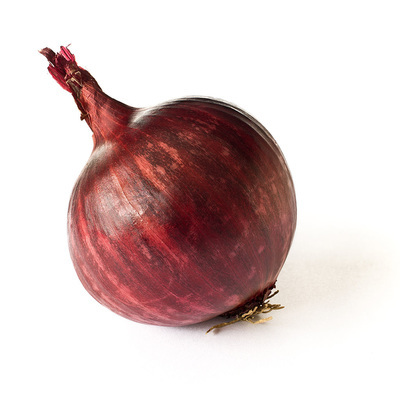 ​Now that spring break is over, I finally get the time to write about another really neat dye - the red onion! 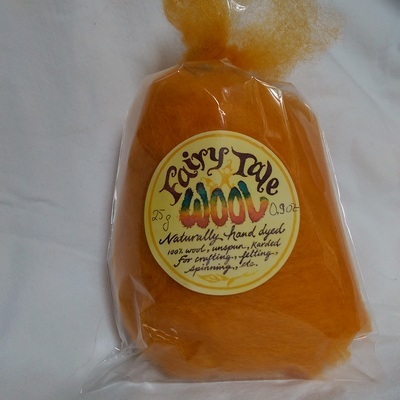 ​Most people who are dabbling in natural dyeing are very familiar with regular/ yellow onion skin which produces beautiful shades of yellow and orange. But the red onion skin is special, you can achieve beautiful moss greens, lichen greens and mustard. ​The dye process is very simple - but acquiring the amount of dried skins necessary for rich shades can be lengthy. I therefore recommend that you develop a good relationship with the person who runs the produce section in your supermarket and ask him/ her to collect the skins for you. It might take them a few days only, they go through so much quickly! Also make sure that they faithfully separate the red from the yellow skins. Even a few yellow ones can really effect the final shades and you won't be able to get that amazing moss green. Mordanting: Weigh your dry fiber, you will need 13% Alum (example: if you have 200g of fiber you will need 26g of Alum). Bring a big pot of water to a boil, add the Alum and let it dissolve completely. Then add the dry fiber, making sure that it can float freely. Turn the heat down and let it simmer for 20 minutes, gently moving it occasionally. Then turn it off and let the fiber cool down in the mordant bath for at least one hour. Take out the fiber, rinse it gently and dispose of the water. Dyeing: There will be 2 consecutive dips, so you need to have enough mordanted fiber for each one (equal amounts for each dip). Do the math and figure out this amount because it will determine how much onion skins you need. This recipe calls for 100% of dry skins. Example: if you are planning on dyeing 50g of fiber in each of the 2 dips (a total of 100g) you will need 50g of skins altogether. This is a contact dye, so alternate layering 50% of the wet, mordanted fiber with layers of the dried skins. 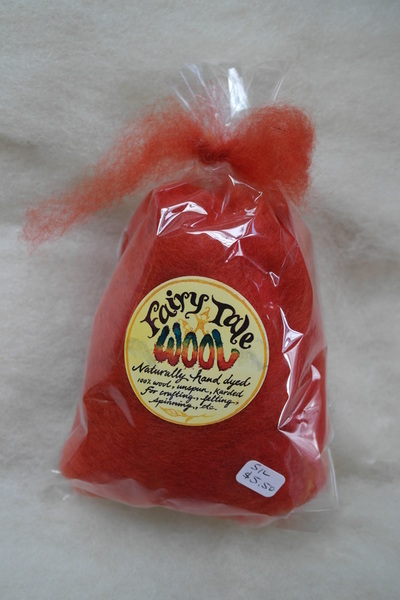 This dye offers particularly beautiful results on wool/silk blends, silk as well as cashmere. For a more even but less intense dye result, boil the skins first before you put the mordanted fiber in. Strain the dye liquid and add the mordanted fiber to the liquid. Then continue as instructed below. 2nd dip (which produces a yellow green/ mustard): add the second half of mordanted fiber and let it simmer for approx. 60 minutes, gently moving it around occasionally. Let the dyed material cool down in the pot overnight. ​Then spin all fiber in the washing machine and, important, dry it first before you wash it. Then gently wash and rinse. The first time I dyed with madder 13 years ago I literally felt the need to put on my sunglasses. Wow, was that ever an intense red! But I have since learned that I can also achieve very muted shades of rust as well as the highly sought after variety of skin-colours for doll-making. 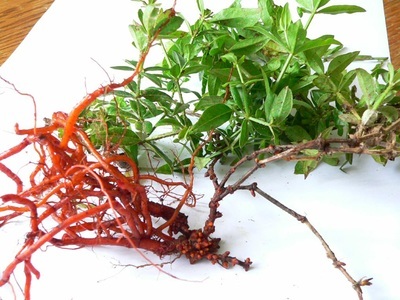 You use the ground up, dried madder root. Please make note that this recipe is for Rubia Tinctoria which can be grown here in the Pacific North West as well as in other more Northern climates. Tibetan madder (Rubia Cordifolia) requires a different recipe but will produce more vibrant shades and is less heat sensitive. In order to achieve those vibrant shades with Rubia Tinctoria it's important not to heat up the dye bath to simmering, except for the 3rd dip. Please also note that madder dyes completely differently on pure silk, the colour is much more coppery. Mordanting: Weigh your dry fiber, you will need 15% Alum (example: if you have 200g of fiber you will need 30g of Alum) and 6% Cream of Tartar. Bring a big pot of water to a boil, add the Alum and Cream of Tartar and let it dissolve completely. Then add the dry fiber, making sure that it can float freely. Turn the heat down and let it simmer for 20 minutes, gently moving it occasionally. Then turn it off and let the fiber cool down in the mordant bath for at least one hour. Take out the fiber, drain and dispose of the water. THEN KEEP IT IN A PLASTIC BAG (OR PLASTIC BUCKET WITH A LID) FOR 1 WEEK, MAKING SURE THAT THE FIBER DOESN'T DRY OUT. ONLY RINSE JUST BEFORE YOU ARE GOING TO DYE IT. Dyeing: There will be 3 consecutive dips, so you need to have enough mordanted fiber for each one (equal amounts for each dip). Do the math and figure out this amount because it will determine how much ground madder you need. This recipe calls for 100% of dry, ground madder. Example: if you are planning on dyeing 50g of fiber in each of the 3 dips (a total of 150g) you will need 50g of madder altogether. The night before you plan on dyeing, let the ground madder soak with plenty of cold water overnight. It will expand quite a bit. The next day fill your big dye pot half full of water and heat it up to no more than 70 C. Use clothes pegs to attach the dye cloth to the rim of the pot, with the middle of it slightly sagging onto the surface of the water. Please do this carefully, you will be working in hot steam! Now scrape the soaked madder onto the dye cloth, unpeg it one after the other and bring the edges of the cloth together without the contents falling into the water. Pull this out of the water, wrap the twist tie tightly around und let the now filled and secured pouch sink into the pot. Top up the water, if necessary. 1st dip: This will produce a vibrant red. Add appropriate amount of fiber and let it sit in the dye pot for approx. 60 minutes, gently moving it around occasionally and making sure never to exceed 70C. Then remove the fiber with the help of a strainer, making sure to collect as much of the dripping dye water as possible in order to return it to the pot. Let the dyed material cool down. 2nd dip: This will produce a rusty-brownish red. Add appropriate amount of fiber and let it sit in the dye pot for approx. 60 minutes, gently moving it around occasionally and making sure never to exceed 80C. Then remove the fiber with the help of a strainer, making sure to collect as much of the dripping dye water as possible in order to return it to the pot. Let the dyed material cool down. 3rd dip: This will produce a rusty brown. Add appropriate amount of fiber and let it simmer in the dye pot for approx. 60 minutes, gently moving it around occasionally. Then remove the fiber with the help of a strainer. Let the dyed material cool down. Wash all dyed fiber gently in cold water, rinse, spin it in the washing machine and let it dry. I just realized that it's been a while since I last released a recipe. It's about time! And it's the right time for walnuts! To be more precise, the hulls of the walnut, and preferably green ones. Because they have more natural mordant and produce more different shades in one dye bath. This recipe is particularly easy as it doesn't require any mordanting. And you get a lot of dyed fiber out of one pot of dye! After every dye bath, the pigments on the fiber need time to oxidate and sadden, So the general rule is that once you take the dyed fiber out of the dye bath, you gently squeeze excess dye out (and back into the dye pot), then lay it out flat to dry completely. Only then wash it gently, spin it and dry again. This recipe has 4 consecutive dips. In the first dip you need 1000% of fresh walnut hulls in ratio to the weight of dry fiber. Example: if you are planning on dyeing 100g, you will need 1 kilo (1000g) of walnut hulls (without the walnuts inside!). For the following 3 dips you will have a ratio of 400% to weight of fiber each. 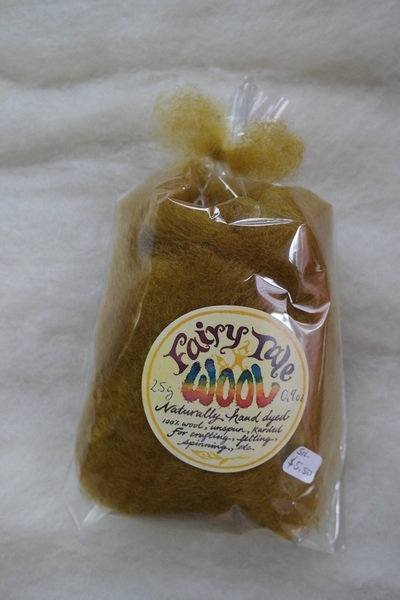 Example: with the 1000g of walnut hulls in the first dip you can now dye 400g of fiber per dip. 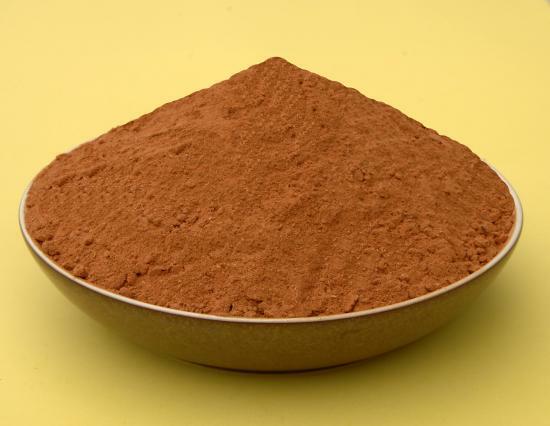 If you want to use more than 1 kilo of hulls you will certainly need a bigger pot than 20 quarts! This dye method calls for a contact dye, which is ok if you want to dye yarn.The little bits of hulls can easily be shaken out. Contact dyes produce much stronger shades. But if you are planning on dyeing roving or even uncarded wool/ silk I strongly advise against a contact dye. In this case keep the hulls in a small laundry bag, in the dye cloth or a piece of cheese cloth. 1st dip: combine hulls and cold water in the dye pot and let them sit for 24 hours. Then add fiber, top up water if necessary and let sit for 48 hours, stirring occasionally. Take fiber out and proceed as described above. this produces a coppery brown shade. 2nd dip: heat up dye bath to 40C, add fiber and let it sit for approx. 2 hours minutes, stirring occasionally and making sure never to exceed 40C. Take out fiber and proceed as described above. This produces a cool beigy-brown shade. 3rd dip: Boil the hulls for 1 hour, then let it cool down to 40C, add fiber and gently simmer for 1 hour. Take out fiber and proceed as described above. This produces a dark brown shade. 4th dip: Add fiber, simmer for 1 hour, then let fiber sit overnight. Take it out, wash and spin it and let it dry. This produces a beige shade.